There are few things in the world that steal my heart. Fewer those capture my soul. Art is one of them. I have a terrible weakness for all things artistic. I can’t help but fall in love with anyone and everyone who hold the talent to create something out of a blank dot. That’s how Melbourne trapped my heart. And that's where Melbourne ceased to be a city, instead went on to becoming something more. Past magnificent architectural marvels and grand iconic structures, Melbourne delighted me with visuals which highlighted a different aspect of its own personality. My love affair with the city was about to begin. With the city map tightly held in my hand, I had ventured out of my hotel room on the first day itself, curious to discover the little streets and crisscrossing avenues lining the city, the city’s most lovable assets in its most natural form. The sounds I heard and the scenes I witnessed were captivating, almost magical. Out there, away from the routine things to do and places to see, I heard this city hum a different tune. Music, painting, magic, puppetry – together, provided for a perfect melody. There were surprises waiting for me at many crosses and turns as the city morphed into a striking canvas dipped in a palette full of colorful art and symphonic creations, having enough enigma to gather my attention. 1. Art on the streets. This was a sight I had never seen before: People, helpless and homeless, immersed in doing what they love in a bid to earn a life and living. It was heartwarming, so to say, and even more when I never witnessed anyone buy anything from them. This sight definitely made for one of my most prominent highlights of the entire Melbourne trip. 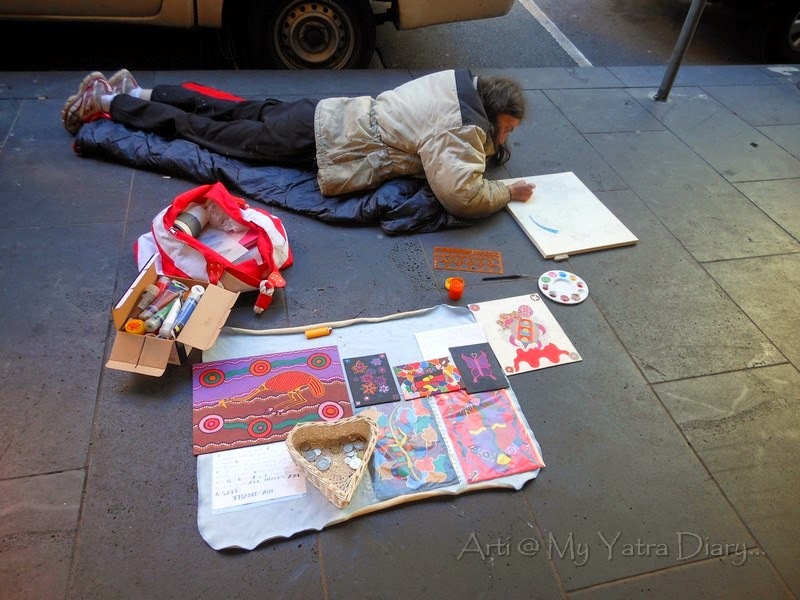 Painting for a living, on the streets of Melbourne. 2. Artistic masterpieces in motion: Art Trams of Melbourne. As part of the Melbourne festival in October 2013, Melbourne had rolled out 8 Art trams to their world famous tram network. And, I was so glad to have seen many and captured at least 3 of them which I would like to share in this little diary of mine. Given below are the pictures accompanied with the words of the artist behind the creative imagination. "I have a great interest in the social history and the appearance of our suburbs. This has manifested itself in many ways, beginning in the 1970s, when I began prolifically photographing my local area of Northcote, as well as other inner suburbs. "You are now sitting inside a giant orange transportation device, covered in floating moon babies, space weasels and crusty old slug men. How did it come to this? Joining Forces is a collective of six Melbourne-based artists who combine wildly diverse styles to make imaginative art. "The backyard design for my tram is based on the backyard that I grew up in, in Altona. It's a stylised pop version of that backyard. The backyard was a site of influential activity in my upbringing, cricket matches with my brothers and our mates and neighbours, family BBQs and 18th and 21st birthdays to name a few. 3. 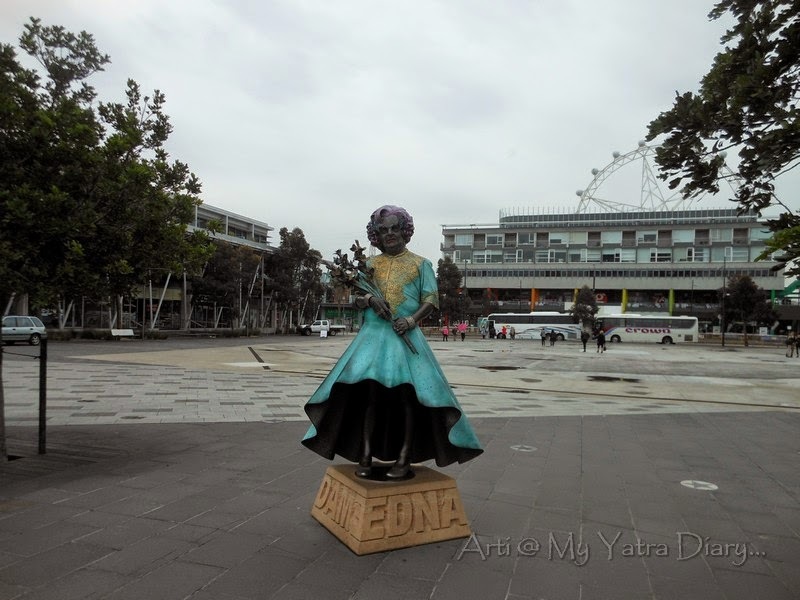 Sculptures in bronze at Waterfront City, Docklands and other star murals. 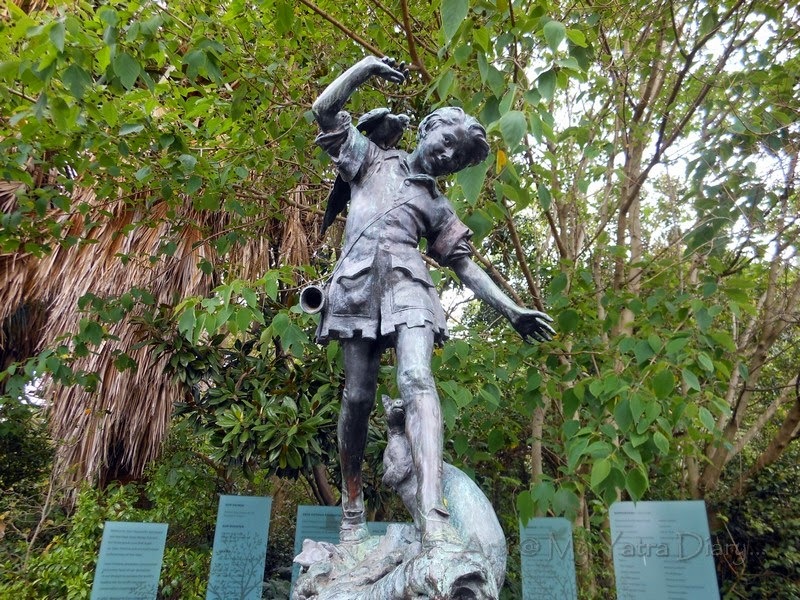 Peter Pan in Melbourne Zoo, enjoying the attention of children and adults alike. of a highly popular nightly variety television show titled - In Melbourne Tonight, also known as "IMT". 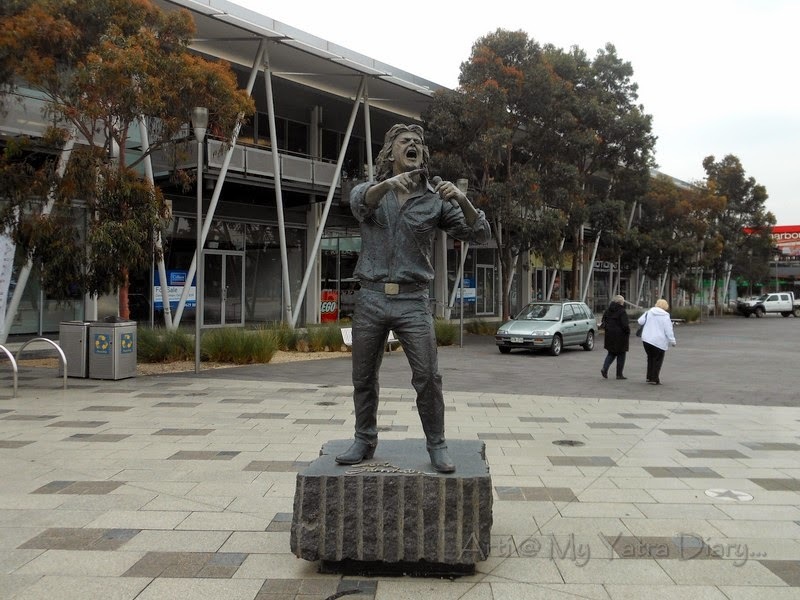 An English-born Australian pop singer, John Farnham is one of Australia's leading performers with a career spanning over 45 years, also the only Australian Artist to top the charts in five consecutive years. 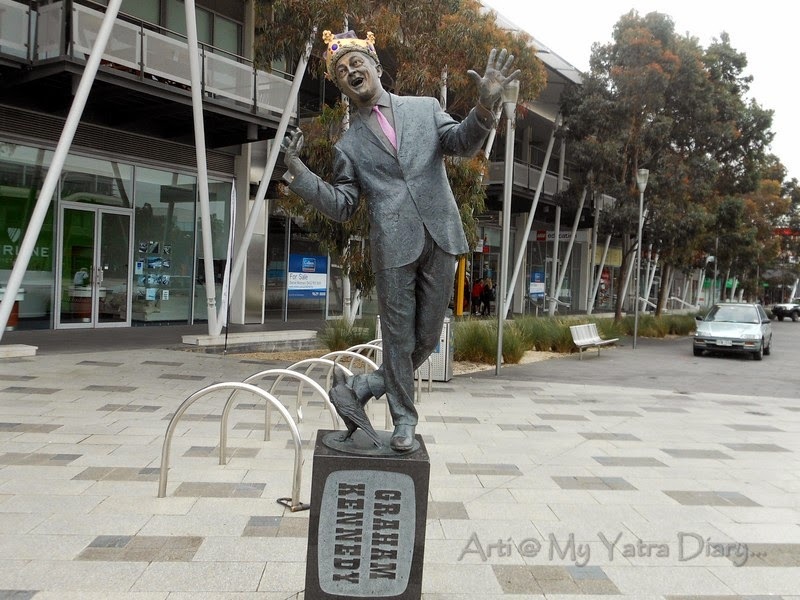 a famous character created and performed by Australian performer and comedian Barry Humphries. 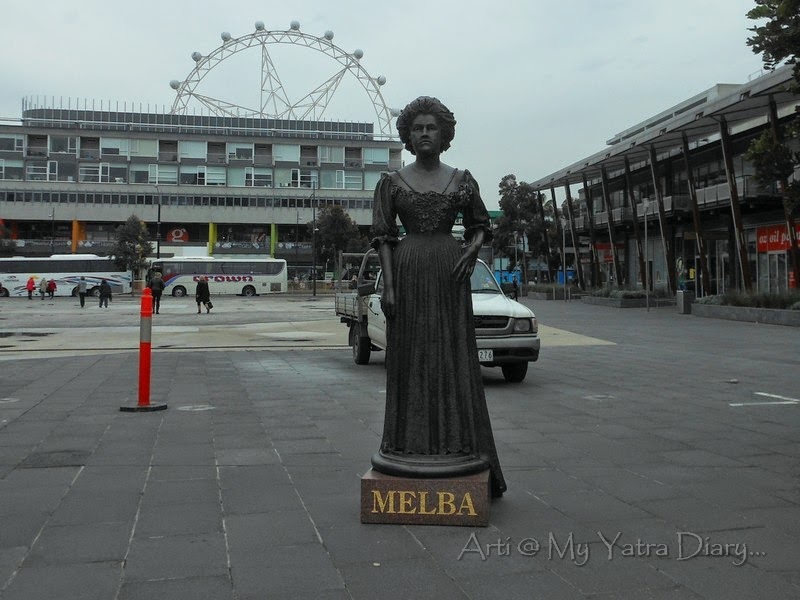 Dame Melba: An Australian operatic soprano, the first Australian to achieve international recognition as a classical musician. 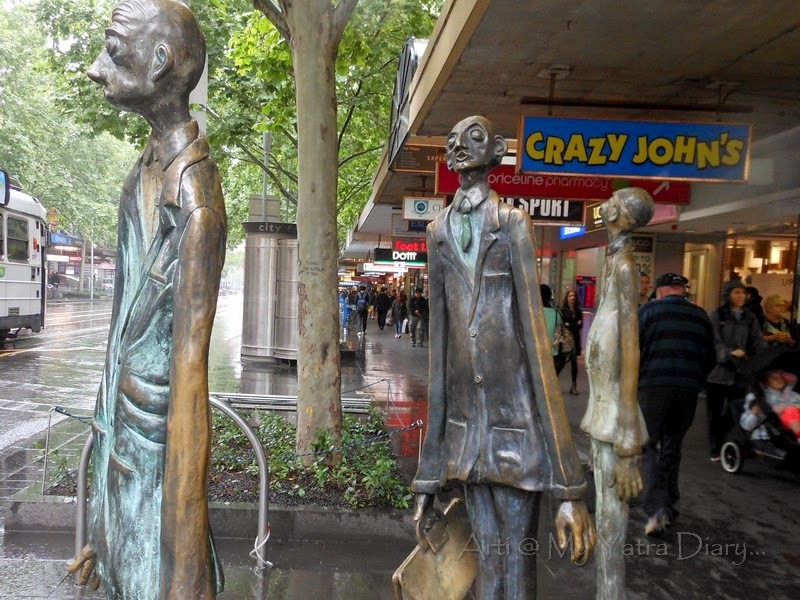 Met these gentlemen, not in Docklands, but somewhere on the streets, roaming, perhaps lost. 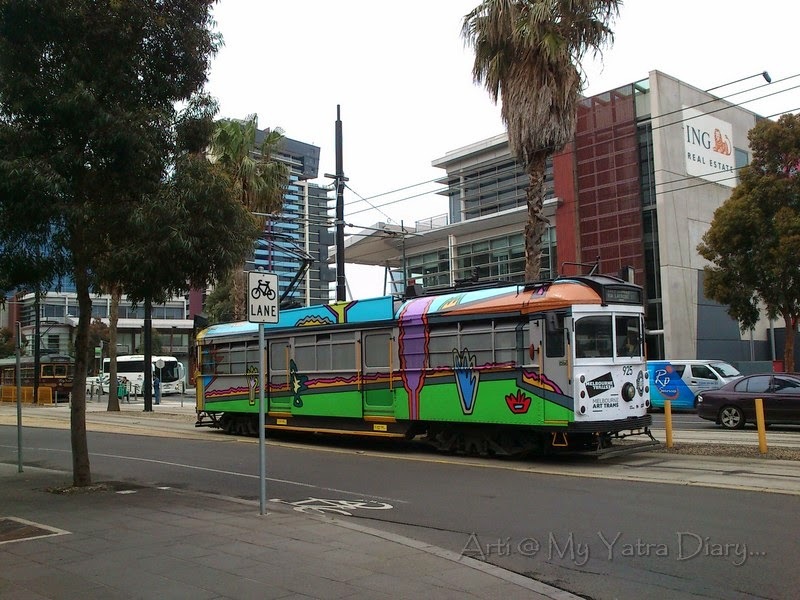 Melbourne things to do #3: My Guide To Melbourne's Tram Car And Myki Card in Australia. Melbourne things to do #6: A stroll in the Fitzroy gardens, Captain Cook's Cottage, etc. Melbourne things to do #7: Admiring the Flinders Street Station. Melbourne things to do #8: Walking the Yarra River Trail. Melbourne things to do #9: See the MCG! Melbourne things to do #10: Discover the Fed Square. I love seeing the street art. Something I miss here in my small town. Melbourne looks surreal with all those art works. Nice one, Arti. I too love and adore artists. Absolutely creative and magical. The local trams in Melbourne are much cooler than the ones in Lisbon, huh? Great street art, much better than the Berlin one! 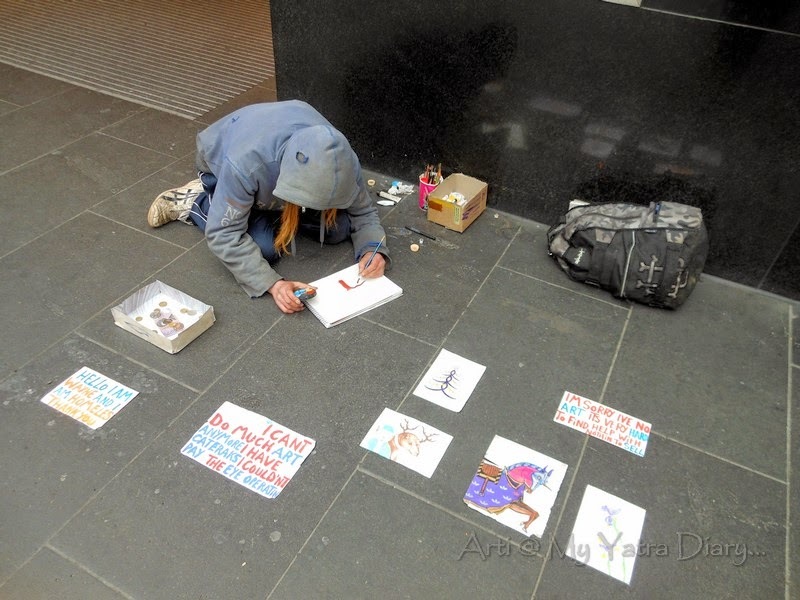 i love people who are artistic.. n looks that Melbourne is filled with such type of persons. Well written post with amazing clicks.. I love the work of street artists. They always have some beautiful painting on display. I love the tram. It's beautifully painted. Thank you for showing us your street Art around Melbourne - love it all. Such a fun thing to do painting the trams, makes it a brighter place. Also fun to see the bronze statues. Those trams are amazing! Nice captures. Nice post with such wonderful pics.. Those street arts are simply superb.. Interesting sculptures ... what fun! I love traveling with you virtually. Arti...I am envious of you...to be surrounded by so much art is AWESOME!!! The girls painting in the street is heart-wrenching though!!! 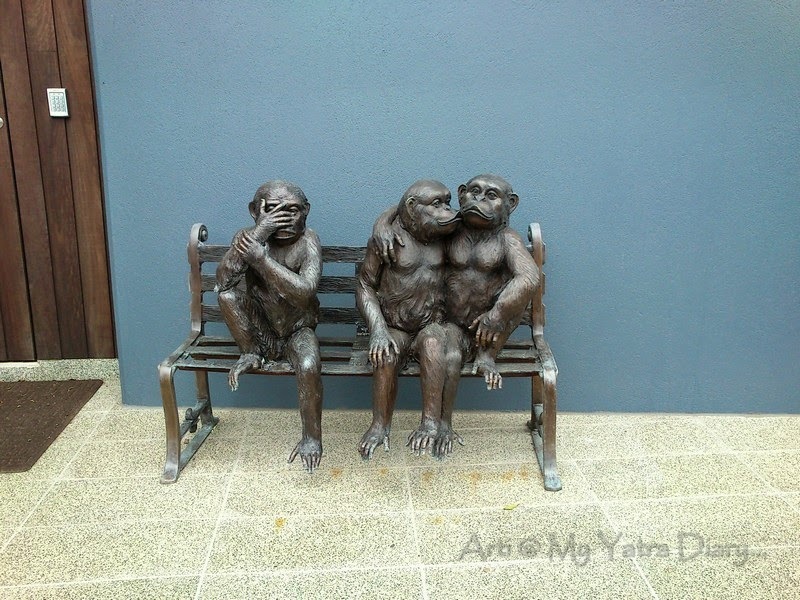 How wonderful, I especially love that monkey sculpture. Its so easy to understand why you feel in love with this city. You've really captured the spirit of the place. A good traveller's spirit you have. Great pics you captured...all the best! This street art is a novel idea-i wonder the cops do not shoo them and the trafic does not disturb them. The second and third trams were a feast for the eyes. Arts in Melbourne are very unique, interesting and talented. The last monkeys make me famous three monkeys in the temple in japan. They cover their mouth, ears, eyes by their hands each other. Thank you for the interesting guide. 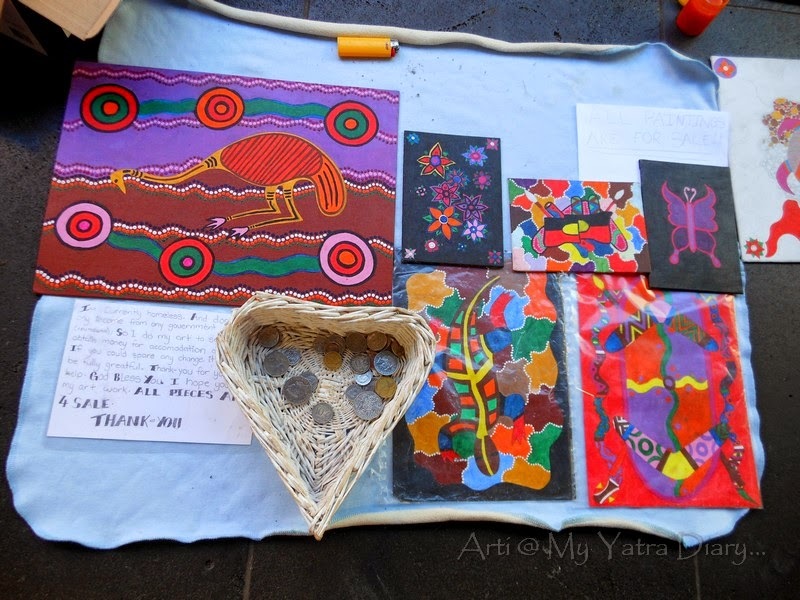 So much beauty you a mnaged to discover in Melbourne, Arti! It makes me now want to go back and rediscover the city:) Missed reading posts as I was away! Beautiful post, Arti....amazing how a magnificent street gallery can be seen right in the heart of Melbourne. I love street art. I always stop whenever I see someone creating something unique and I would have stopped with these guys. They are great. This looks great, we.are headin to Australia soon, will definitely check these out. Things to do in Melbourne: See the MCG!